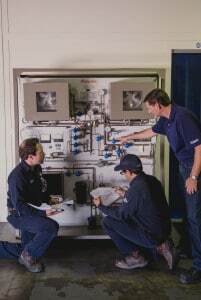 Quality Refrigeration understands the benefits of a well-rounded, proficient workforce and has dedicated company resources and time to ensuring all employees receive the training and information they need to effectively tackle both simple and complex service assignments. The value placed on developing a high caliber workforce inspired Quality Refrigeration to establish a training center located at the Wilmington office headquarters. Known as Quality University, this valuable in-house training center hosts classroom trainings to help our staff develop new skillsets, learn more about relevant equipment, and practice industry-standard safety procedures, effectively elevating the performance of all of our technicians. Employee experts in various industry subjects demonstrate techniques and procedures to those technicians that are still building expertise in the subject. This helps to expand the subject capabilities across the entire team. 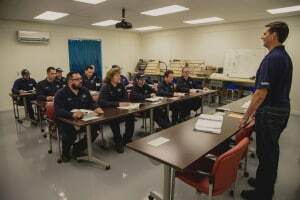 Since this training occurs on a weekly basis, the technicians are constantly educated, allowing them to steadily increase valuable service capabilities to a variety of customers. Product manufacturers are also invited to Quality University to educate the technicians on any new products as well as offer any product-specific service tips. Learning directly from the equipment manufacturers allows the technicians to receive the most relevant guidance on how to best service equipment, ensuring optimal performance and maximum lifespan. Quality University continues the education process in the field as well. Senior technicians regularly take developing technicians on more complex jobs to give them the opportunity to observe proper service methods and procedures at work in a real world environment. This practice is instrumental in developing each technician to achieve the highest proficiency with respect to quality service, safety procedure, and overall expertise. In short, Quality University is a not just a training course, it is part of our company culture. In our efforts to provide our valued customers with the best service possible, Quality Refrigeration has made it a priority to ensure our technicians are well versed in all aspects of the work they perform, so there is a team of experienced and capable technicians available to tackle any challenge that may arise.